This bronze Colonial Dames plaque was placed in 1924 on the Market House in Fayetteville and outlines the historical significance of the city during the Colonial period and early years of the Republic. The plaque incorrectly has the completion date for the Market House as 1838. It was completed in 1833. 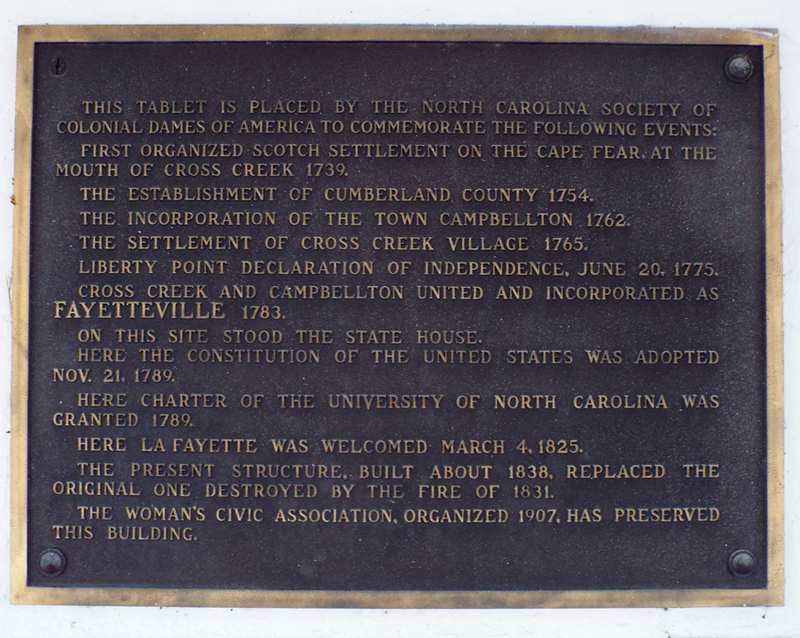 THIS TABLET IS PLACED BY THE NORTH CAROLINA SOCIETY OF / COLONIAL DAMES OF AMERICA TO COMMEMORATE THE FOLLOWING EVENTS: / FIRST ORGANIZED SCOTTISH SETTLEMENT ON THE CAPE FEAR, AT THE / MOUTH OF CROSS CREEK 1739. / THE ESTABLISHMENT OF CUMBERLAND COUNTY 1754. / THE INCORPORATION OF THE TOWN OF CAMPBELLTON 1762. / THE SETTLEMENT OF CROSS CREEK VILLAGE 1765. / LIBERTY POINT DECLARATION OF INDEPENDENCE, JUNE 20, 1775. 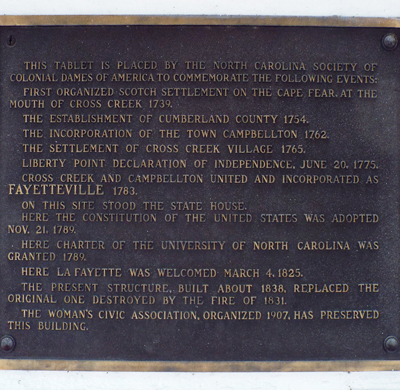 / CROSS CREEK AND CAMPBELLTON UNITED AND INCORPORATED AS / FAYETTEVILLE 1783. / ON THIS SITE STOOD THE STATE HOUSE. / HERE THE CONSTITUTION OF THE UNITED STATES WAS ADOPTED / NOV. 21, 1789. / HERE CHARTER OF THE UNIVERSITY OF NORTH CAROLINA WAS / GRANTED 1789. / HERE LAFAYETTE WAS WELCOMED MARCH 4, 1825. / THE PRESENT STRUCTURE, BUILT ABOUT 1838, REPLACED THE / ORIGINAL ONE DESTROYED BY THE FIRE OF 1831. / THE WOMAN’S CIVIC ASSOCIATION, ORGANIZED 1907, HAS PRESERVED / THIS BUILDING. A cold January drizzle drove the dedication speaker and local dignitaries into the shelter of the Market House while leaving the honor guard of American Legionnaires and Boy Scouts holding their ground against the elements. Following an invocation by Dr. W.E. Hill, “America” was performed by the Fayetteville Choral Society. Mrs. John Anderson, on behalf of the Colonial Dames, presented the plaque to Fayetteville mayor H.M. Robinson. Mrs. Anderson and Miss Kate Broadfoot then unveiled the plaque. The most sought after dedication speaker of the time in North Carolina, Chief Justice Walter Clark of the State Supreme Court, delivered the keynote address. The Market House, completed in 1833, replaced the 1788 State House, which was destroyed in the Great Fire of 1831. At the State House, North Carolina had ratified the US Constitution, chartered the University of North Carolina, and ceded her western lands to form the State of Tennessee. Architecturally unique, the Market House is the only National Landmark in Cumberland County and one of only 40 in North Carolina. The plaque can be found on an interior west facing column in the Historic Market House which is located in the center of a traffic circle at the convergence of Hay, Gillespie, Person and Green Streets in downtown Fayetteville. A small plaque on a nearby column recognizes Ida Sutton and J.H. Myrover who were responsible for saving the Market House from demolition in 1906. There are also plaques to the Memory of Sold Slaves, National Landmark status and the 1788 State House. The Historic Marker House is surrounded by historic and modern building, trees and bushes.